I love books. My idea of a good vacation is one filled with trips to bookstores and time reading in a coffee shop. For years, the only thing I ask for at Christmas was book money. And when I move, the majority of my efforts are spent trying to figure out how to move all my books safely. But I have been wary of e-readers for several years. I’ve had two main problems with e-readers. First, I have heard that it is cumbersome annotating (making notes, underlining, etc.) books. Second, the books are, well, digital, and so feel impermanent. If I have a book on my shelf, it’s can sit there for years. I can scan my bookshelves and be reminded of the books I’ve read. I can reread it or loan it to a friend. Digital books seem too easily forgotten about. I am uneasy about that. But I did buy an early version of the Barnes & Noble Nook. And I didn’t like it. I used my iPad for a few weeks to read books, but I didn’t like that either. It was too bulky, and I just didn’t like reading on its screen. But I was intrigued when I saw some ads for the Kindle Paperwhite. It seemed to solve all the problems I had with my old Nook. The entire screen was a touchscreen, which made highlighting text as easy as dragging my finger across the screen. I can read it in the dark, thanks to some nifty technology that lights up the screen. And since it is a Kindle, it has a wide range of books available from Amazon.com, including plenty of theology and philosophy books. So I went out a few days after Christmas and bought a Kindle Paperwhite. I’ve been using it for months, and I am pleased with my experience. The Kindle Paperwhite is well-designed. According to its specs, it weighs around half a pound. The screen is six inches, which is large enough to read comfortably while still being portable. And the screen has a nice lighting to it, making it easy to read in dark rooms. In short, yes. It only took me a moment to figure out how to navigate around its menus. I don’t think it would be hard for anyone to figure it out. It did take me a little longer to get used to the touch screen. You turn the page forward by touching one section of the screen. You turn back a page by touching another section on the left of the screen. You bring up the information about your location in the book by touching the bottom of the screen. And you bring up the menu bar by touching the top of the screen. If this sounds intimidating, just know that the Kindle has a helpful tutorial that appears during your first use of it. 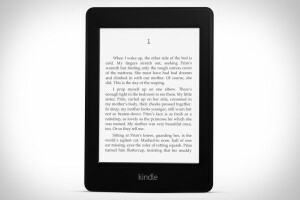 Kindle advertises that the battery life is around 8 weeks, according to the average user’s use of the device. So, unlike all the other electronics in my life – iPad, iPhone, and Macbook – I never have to worry about whether it is charged when I take it with me. A keyboard pops up on the screen whenever you select a text box (whether to search the Kindle store, search a book, write a note, etc.). I don’t have any big complaints about it. It works about like I expected: adequately, but not perfectly. The lag between touching a key and the character appearing is too annoying. I frequently type a word and then realize that the device is lagging behind, skipping some of the letters I’d pressed. Great selection of books that are just a click away. A little too tempting for someone on a tight budget. Portable. I can take it anywhere and read from a wide selection of books. Adjustable font, margins, and line-spacing. It is nice to get to alter the appearance of the text to suit my reading preferences. Reading at night. I’ve always stayed up later than my wife. I don’t have to worry about bothering her by keeping our lamp turned on. Searches a dictionary and Wikipedia for words or phrases you select. It’s nice to be able to highlight a historical figure and search for more information about it. It helps me better understand older books that mention people and places I’m unfamiliar with. 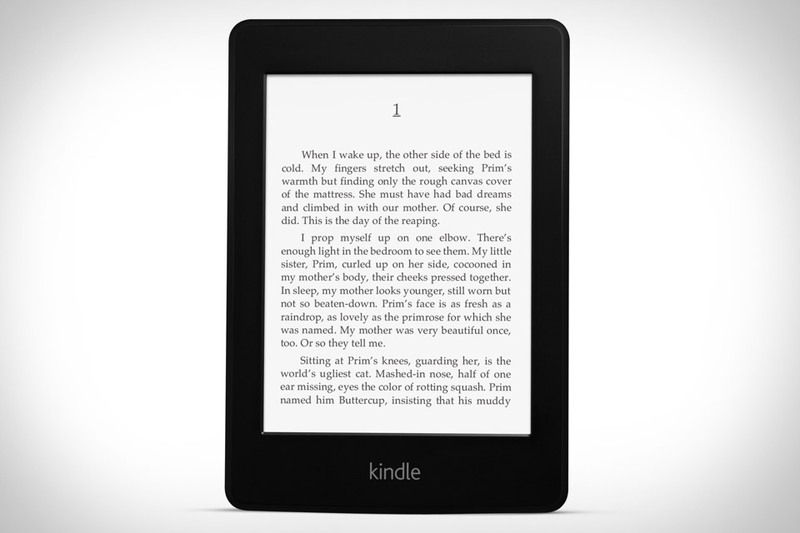 You might be wondering how my initial concerns about any e-reader – the difficulty annotating and the feeling that digital books are too easy to lose or forget about – have been addressed by the Kindle Paperwhite. The impermanent feeling of digital books is still there. But, regarding annotations, I have found annotating on the Kindle Paperwhite much easier than I’d imagined. Annotating is easy enough. I don’t have to worry about having a good pen or pencil with me. And it’s easy to delete notes or highlights that I no longer want. But I cannot seriously annotate books like I’m accustomed to doing. I like to bracket important phrases, put various symbols in the margins, write long notes, mark entire paragraphs, and so on. All that aids in my reading and studying a text. The Kindle doesn’t permit such diverse markings. But I expected that. So I never read books on my Kindle that I really want to study. A physical book is much better for that. But annotating on the Kindle does have some advantages. Mainly, it stores all my highlighted passages and my notes. I can access them online. That alone would be a nice benefit. But I learned how to “clip” my notes and highlighted passages into Evernote. Now I can print all my annotations and highlighted passages. And all my notes and highlighted passages are searchable with Evernote This is amazing for putting together lessons on a topic. I can read several books on the topic, print the highlighted passages and my notes, and assemble my lessons. It is a great tool! Anyway, I couldn’t be more happy with my Kindle Paperwhite. I hope the Kindle line of products will be around for a while. They are well-designed for book-lovers.